In our last post, we talked about the great cosmetic dentistry services you can find at Robison Dental Group. Today, we’d like to focus on just one of those services: teeth whitening. Teeth whitening is one of the most popular and effective cosmetic dentistry services available anywhere. With it, cosmetic dentists like Dr. John Robison and Dr. J.D. Robison can help patients eliminate teeth stains caused by foods, drinks, smoking, aging, and more to uncover a glamorous, confident smile. What’s more, at our Canton dental office, we offer two convenient options for patients to choose from: in-office teeth whitening and at-home teeth whitening. With in-office whitening, you can leave our Canton dental office with the whiter smile you’ve dreamed of after just one appointment. With at-home whitening, on the other hand, you can achieve the same professional results while sticking to your normal schedule. 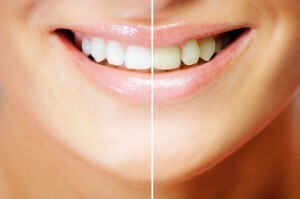 Both are effective, and when combined, you can have a whiter smile that lasts even longer. If you’re curious about how teeth whitening can help you, call Robison Dental Group today for a consultation appointment. We’re always happy to talk to patients from Canton, Ann Arbor, Northville, Westland, Plymouth, and beyond about how our cosmetic dentists can improve their smiles. Get in touch with us today!